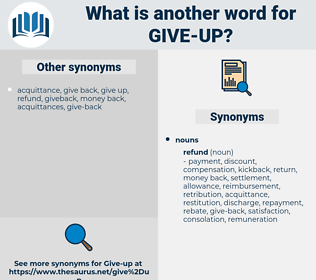 What is another word for give up? part with a possession or right; " I am relinquishing my bedroom to the long- term house guest"; " resign a claim to the throne"
put one's tail between one's legs. withdraw from agreement or statement. come, stay, defend, assert, challenge, remain, assume, defy, continue, maintain, keep, hold, retain, usurp, claim, treasure, win, pursue, DO. embrace, want, encourage, allow, face, meet. dissent, uphold, go forward, permit, advance, dispute, reject, refuse. attach, mend, agree, restart, secure, fix, keep quiet, fasten, persist, put together, join, wait, stabilize, obey, secret, strengthen, hide, cause. disapprove, withhold, gain, guard, deny, disallow, take over, oppose. condemn, dissuade, neglect, rebuff, disobey, resist, fail, decline, prevent, ignore. disagree, veto, repudiate, contradict, Disacknowledge. differ, object, forbid, demur, protest. confine, restrict, detain, imprison, be quiet, capture, restrain, limit. assist, care, stop, help, aid, come back, support. endure, resume, finish, go on, carry on, complete, persevere, keep on. choose, take in, ratify, sanction, admit, approve, welcome, save. commence, start, unite, go, give birth, initiate, connect, retry, bear, begin, create. pay attention, take, regard, note. downpour, build, marry, set up, mount, take up, compliment, go up, increase, ascend, rise, pour, schedule, praise, raise. climb, scale, overcome, attain, overthrow, reach. rediscover, revert, return, go back. go back to, acknowledge, corroborate. hold out, stand up to, withstand, fight. collect, succeed, hold on to, give, gather, hoard, confront, starve, accumulate, achieve, fill. release, jump in, go ahead, let go. confuse, suppress, leave alone, obscure, cloud, conceal, seize, remove. check, undertake, vindicate, haunt, favor, prosecute, cherish, seek, adopt, advocate, court.